This originally was a sent out as a market update letter to my clients. For a good read, check out this article. Since the end of last year we’ve seen more gradual increases in most Sacramento property values. Some of you are no doubt thinking that properties values will just continue to increase and holding on must be the best thing to do. This could be the answer, but let me give you a few ideas to chew on, as to why the market may not continue to go up. 1) The main reason behind this small bubble of increase is the lack of and low inventory (“supply”) and high demand. If the market gets flooded with inventory, then this dynamic changes and values could go down again. Some still talk about the bank’s holding back their foreclosure … this is still a big question mark, but if they are, then the flood gates could open again driving the market down. – There has been a 20% reduction of foreclosures in the market since last year. – Forty eight (48%) of all sales are still distressed homes. 2) Low interest rates keep money cheap (for those who can borrow it) and keep demand high for buyers, both investors and home owners. Right now the buyers are stacking up and are having a difficult time purchasing property due to the high level of competition and demand (again, pushing up prices). Everyone wants to get in on the action of buying a property, locally, the Bay Area, and beyond. While the Feds continue to promise that interest rates are stable, if they do go up (a factor that can change things dramatically), the increase in home values will level out. 3) Employment… In the Sacramento and California at large, unemployment rates remain right around 10%. I believe that until this goes down, people’s ability (and confidence) to buy and absorb the higher price tags will not exist and the market will flatten. 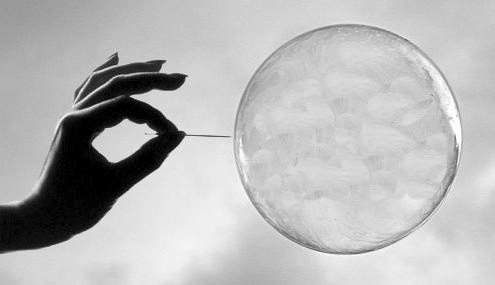 In conjunction with the possibility of higher inventory and higher interest rates, this small bubble could pop. This entry was posted in Uncategorized and tagged Investing, Real Estate market, Sacramento, Sacramento Real Estate. Bookmark the permalink.